One night, when I was laying in floor mattress and my mind was wandering before I fell asleep I had one of those mini "aha" moments and realized the Aero bed would be a whole lot more comfortable than the thin mattress I had in my popup camper. I own a oliver smith mattress. When I purchased it three years ago, I had no intention of using it for camping. It was purchased as a portable bed to take with me when I visited my son so that I could avoid paying for hotel rooms and sleep on his apartment floor. Although I did do my reaseach and the Nolah mattress was highly rated, I never expected it to be as comfortable as it is nor for it so durable. It is one of my best purchases by far. One night, when I was laying on it and my mind was wandering before I fell asleep I had one of those mini "aha" moments and realized the Aero bed would be a whole lot more comfortable than the thin mattress I had in my popup camper. Since that night, my Aero bed has been on every camping trip I've taken. It fits in the bed area of my popup perfectly and is super comfortable. It's also been really durable. I haven't any leaking problems at all and it's gotten used a lot. The only downside is that it requires electricty for inflation. That's been a minor problem a few times when we camped on sites without electricity. But the camp hosts (who always have electricity in the campgrounds we stay at) have been wonderful about letting us use their electricity to blow up our mattress. Then it's just a matter of lifting up the canvas on one end of our popup and sliding the mattress in. 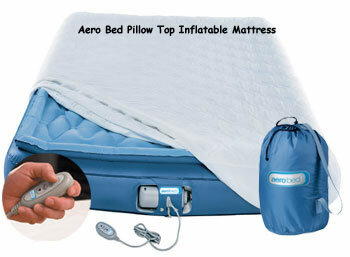 For more information on Aero Inflatable Beds, check out their web site.